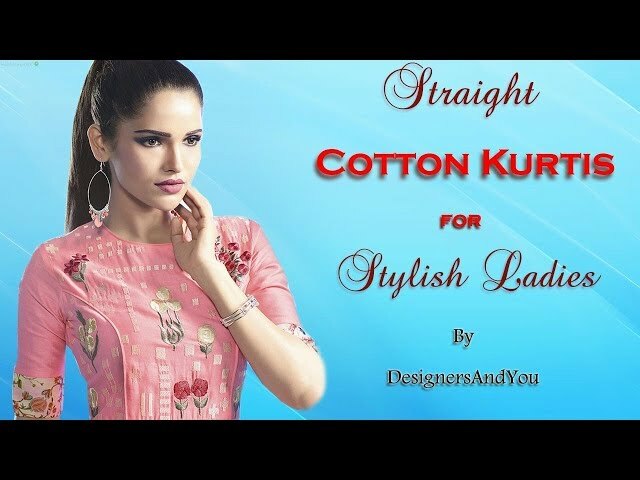 Kurtis comes in various patterns, lengths, cuts, shapes & styles. Asymmetric, tulip, tail-cut, trail-cut & c-cut is popular among teenagers. 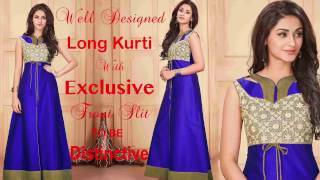 Anarkali, A-line, high low, dhoti & Angrakha shape kurtis are 1st choice of young ladies. Girls prefer flared, indo western, double layered & reversible Kurtis. Tiered, shirt, jacket, overlay, kaftan, pin-tuck style kurtis are in trend. You can find kurtis with countless work of handprint, digital print, embroidery, lace and stone at border and body. Girls prefer to pair straight pants with latest designer party wear long kurti with a front cut design as well as palazzo jeans pants, skirts & leggings. You can discover latest models and designs of printed or plain trendy tunics to wear at any event. Handmade embroidered kurti is the best choice for any occasion. Machine embroidered asymmetrical long kurta designs are extraordinary clothing for gatherings & wedding. Machine prints or hand printed rayon long kurtas for women are perfect for day-to-day life. These tunics denote the complete expression of your style without explanation. Rather than wearing exhausting salwar kameez, kurtis with front cut can change your look. You can wear front cut open (or with Zipper/Chain) long kurtis design with pants, tights, leggings, Patiala salwar or churidar. No need to worry or taking any stress over your age or shape & size. Additionally, it is not obligatory to convey dupatta over it. Anyone can wear straight kurta design with the latest pattern of stole, scarf or dupatta. These fancy long kurtas are latest innovations that look good for any age women. You may find different types slits in designer party wear long kurtas for girls. Latest party wears long kurta tops designs comes with a front slit for ladies is now accessible online from indian to your destination. Make purchasing simple from home without worry of strolling in stores. In the event that you need to be fashionable ladies, long kurta design with jeans pants for women will attempt your envy. It is one of a kind of model that will end up with modesty symbol for somebody. In a recent time, the craze of a very floor length kurta in India is increasing with each passing day. Straight Cut style includes modish look and solace. Front zipper & patchwork styles new designer kurta make any lady look thin. It offers slimmer figure from tummy, hips & thighs. Full sleeves, sleeveless, and 3-4th (three-fourth) sleeves are more options for fashionable women. You can go with short sleeves as well. There are various modes of neck designs accessible in linear kurta designs. These kurtas are well designed out of fabrics such as cotton, silk, chiffon, georgette, net and so forth. On the off chance, you need to pick as per your body structure and like of fabrics. The floral floor-length umbrella kurtas are the best to wear with leggings to add extra glamour. Current trend inspires Indian women to match with something distinguish. They combine parallel pants with full-length-symmetrical kurta designs and that looks awesome. These designs invented from the traditional frock designs. It always looks classic and gives a feeling that frock model has come back again in fashion. The primary effect of this kurta model is younger look. It assists in hiding your age and give bubbly style to the party. Today, Indian media are playing a major role in female’s fashion and style. They always wish to look like their favorite celebrities as they see on Television. They dare to do experiments with their decorating style. Young College-Going Modern Girls loves to appear like a Diva. They prefer Pakistani & Indo Western style front open kurti design that looks fabulous with palazzo pants.Front slit (cut) is a unique pattern that is widely accepted by the young generation. They prefer front open instead of side slits because it gives a fresh look to the wearer. Kurti with Front Zip/Chained is also in vogue because it is possible to team up with latest style bottom wear. You can select to make a set of readymade stitched designer party wear long kurti with palazzo online. Shop simple and elegant Indian fashion long kurta tops with affordable price. Find various offers for regular fit a line kurtis. You must find the latest trend of the fashion and update your wardrobe. You may find a various range of price for long kurtas buying that can suit your budget. It starts with Indian rupees 500. You can find smart products between 500 to 1000 rupees. You can buy some nice zipper kurtis within range of 1000 to 1500. If you want to go with exclusive full-length Lucknow kurtis than we offer you on and above 2500. Hope you might have found products of your choice. We will appreciate you if you feedback us. We would like to hear your progressive suggestions. Like to know about your experience of your buying with us. Hope you will like our latest designs of straight fit & front cut kurti. Both are the best variety of latest fashion for women. Nowadays girls prefer to pair straight pants with long kurtis which are available online for shopping at best price from India. Visit designersandyou.com for latest chiffon & georgette long tops designs online shopping.